I love Thanksgiving, don’t you? What I don’t love is not being able to find my tablecloth and napkins and trying to thaw an overpriced turkey in record time. 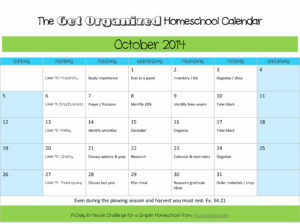 This week we’ll get organized for Thanksgiving so we can have a relaxed holiday. What did your family love about last year’s holiday? What was a disappointment? You may be surprised by your children’s answers to these questions. You may also want to ask if your celebration made them more aware of God’s goodness as we want gratitude to be a prominent feature of the day. Plan time-savers. Several years ago, I determined that I really didn’t like getting up super early to bake a turkey. So I made it the day before and it made Thanksgiving a joy. My husband slices the turkey (we make two when we host extended family) and we store it in turkey broth to keep it moist for the next day. 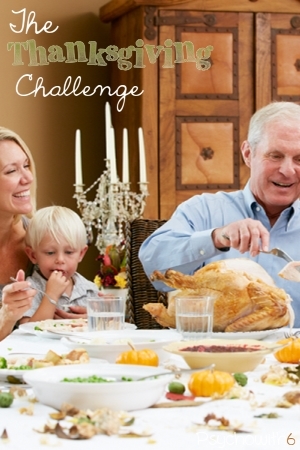 Look for ways to make the day of Thanksgiving less stressful if you’re cooking. Plan the meal itself. If your family does Thanksgiving pot-luck style, now is a great time to decide who will bring what. I like to make more than I think I’ll need because we absolutely love Thanksgiving leftovers. If you don’t have your holiday recipes organized, now is also a good time to find them. Fortunately, I’ve posted my mom’s stuffing recipe on the blog, so it’s easy to find! Plan the decor and table settings. If you are hosting Thanksgiving and you already have the decorations and tableware you need, just make sure you know where they are! If not, look at some of the great ideas I’ve pinned on Pinterest. We have a large enough group, that I use paper for Thanksgiving and I found some fabulous paper goods at Hobby Lobby. I have also purchased my Thanksgiving decorations there for 50% off. This is the perfect time to plan a Thanksgiving unit study. Blessed Beyond a Doubt has put together a list of unit studies that you should definitely check out. 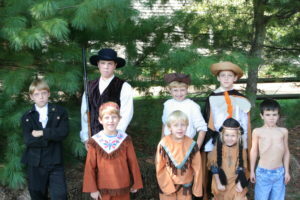 Our homeschool co-op reenacted the first Thanksgiving one year, complete with a feast with our friends. If you’ve never done this, I highly recommend it! If you’re not ready to go all out with a unit study, decide on a special way of helping your children focus on gratitude this month. Read this post on how to teach your children gratitude and I’ll be sharing another post on the subject this week. I’ve pinned some other creative ideas for teaching gratitude as well. It isn’t too early to buy non-perishable items for your Thanksgiving meal. Whenever you buy, plan to hit the sales. If you need linens, paper goods, or materials for your Thanksgiving unit studies, buy them now. You’ll be very thankful you did! What’s your favorite time-saver for Thanksgiving?